Johann Wolfgang von Goethe often liked to say that Europe was the heart of the world, the Alps - the heart of Europe, Tyrol - the heart of the Alps. Innsbruck definitely can be defined as a historical symbol and a cradle of culture and civilization. This picturesque old town is combined with the modern face of the ski resort center which is situated in the heart of the Alps in western Austria. 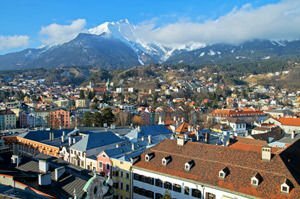 Innsbruck owes its beauty to the beneficial astoundingly geographical area in which it is located. It is exactly situated in the valley of the River Inn, which divides the resort into two parts and which in fact is its godmother. Today Innsbruck is one of the best and most prestigious ski centers in Austria. In a year thousands of skiing enthusiasts visit there for their favorite winter sports. 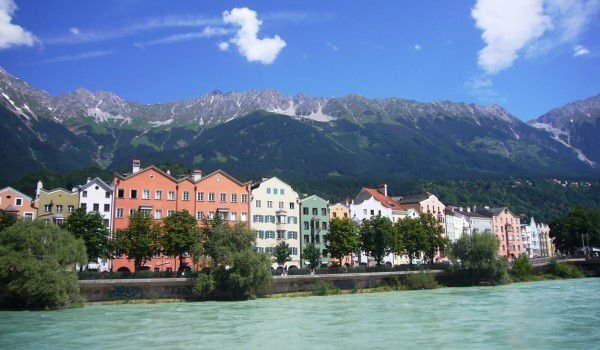 The history of Innsbruck began at the dawn of the new Count when the settlement was based on the site of a Roman colony between the 1st and 5 century. Originating from a Roman colony, in the 12th century Innsbruck became the face of a shopping center. In the 13th century and more precisely in 1239 Innsbruck was granted the status of the city. In 1363 Innsbruck was connected to the empire of the Austrian Habsburgs, and reached its zenith in 1420 when it was declared the capital of Tyrol. Maximilian I was struck by the beauty of the local Tyrolean territory and immediately fell in love with Innsbruck. In 1805 the French put his hand over the picturesque village in the heart of the Alps, and shortly afterwards Innsbruck was connected to Bavaria. After about a decade, in 1815 it was again returned to the Austrian Empire. Innsbruck is rightly regarded as the only resort in Austria, with on the occasion one to argue that it is a city with a past. One of the historical characters of Innsbruck and perhaps most remarkable is the Ambras Castle, which testifies to the glorious history. Ambras is located in the hills above the city. From 1563 to 1595 the castle in Innsbruck was the residence of Ferdinand II. Its place was erected in the early 10th century, but 100 years later it was destroyed. Parts of its foundation, however, were used to construct a modern building of the palace. After the death of Ferdinand II Ambras was inherited by his second son, Charles II, who was not tied with sentimental feelings towards the residence of his father and sells it to Emperor Rudolf II.Today in the beautiful white Ambras Palace you can see the oldest out a collection of paintings and weapons from across Europe and on the second floor of the castle you can see a collection of works of art with over 200 portraits. Credit for this unique collection of art objects goes to Ferdinand II, who built when still living in the lower part of the castle an art museum. Despite its dignified imperial biography, Innsbruck today focuses primarily on the image of a modern ski center. Suffice to that Innsbruck twice has hosted the Winter Olympics - first in 1964 and then in 1976 when residents of the U.S. state of Colorado voted against the bond issue to finance the games in Denver City. An excellent sports facility in Innsbruck is the multifunctional Stadium, Tivoli Neu, which opened in 1999 in the southern part of town. Resort life in Innsbruck never stops and this contributes well to over 20 thousand university students. To satisfy both the needs of students and tourists from around the world, Innsbruck is full of bars and the nightclubs are concentrated in the area behind the central station. Be sure to indulge in some of the unique local restaurants and be sure to try the fresh cooked trout and the incredibly delicious fried specialty prepared from potatoes, onions and beef with spices.